Either you've had these coals before and you've come back to stock up with a larger box, or a friend told you how great these coals are and you know you'll need more than the 1kg box. 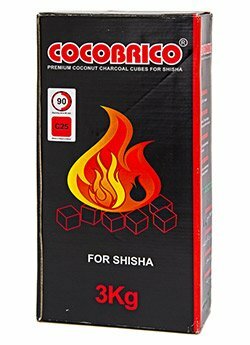 CocoBrico hookah charcoals have established a name for themselves by creating a series of high quality charcoal for hookah smokers in a lounge, house, or outdoors setting. The smooth cube shape pieces measure at 25mm on all 4 sides and work perfectly a top any hookah foil, or heat management devices. These coals are crafted with the use of all natural materials with a main ingredient consisting of raw coconut husks, and let it be known that no trees harmed in this process. This 3kg box contains 216 pieces of the Cocobrico cube hookah coals, creating 72 to 108 sessions depending on your heating requirements. This larger box contains 3 individual wrapped kilos of natural charcoal, this packaging keeps the coals dry and ready for when they're needed. This charcoal is widely used because of it's low ash content that doesn't leave you with a mess after a session, and durability as they're crafted to not split or spark after heating. The Cocobrico coals are rated as a high heat charcoal and you are easily able to produce massive thunder clouds with maximum hookah flavor. Cocobrico hookah coals are rated as a high heat charcoal and you are easily able to produce massive thunder clouds with maximum hookah flavor. Widely used because of it's low ash content that doesn't leave you with a mess after a session, and durability as they're crafted to not split or spark after heating. Smooth cube shape pieces measure at 25mm on all 4 sides and work perfectly atop any hookah foil, or heat management devices. Crafted with the use of all natural materials with a main ingredient consisting of raw coconut husks, and let it be known that no trees harmed in this process. 3kg box contains 216 pieces of the Cocobrico cube hookah coals, creating 72 to 108 sessions depending on your heating requirements. Packaging keeps coals dry and ready when they are needed - box contains 3 individual wrapped kilos of natural hookah charcoal. If you have any questions about this product by Cocotama Hookah Coals, contact us by completing and submitting the form below. If you are looking for a specif part number, please include it with your message.